Epson have launched the Point of sale variants of the Surecolor T Series range with a fantastic money saving offer. Automatic output in large-sized posters. Includes ready-to-use layouts for a variety of applications including fashion,groceries, travel, plus many more in A0, A1, A2, A3, A4 formats. The Epson SureColor SC-T3000 (24"), SC-T5000 (36") and SC-T7000 (44") offer fast, reliable printing on coated and uncoated media. Designed to fit seamlessly into the office environment, the printers feature sleek styling, small footprints. These 4-colour printers are ideal for applications where speed and economy are paramount, such as printing maps, presentations, POS material, posters and indoor signage. 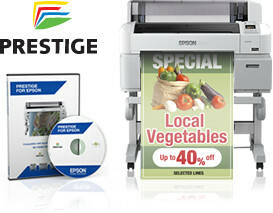 POS versions include FREE Prestige Poster for Epson software. The new SureCOLOR SC-T range features three models, firstly the SC-T3000 which is an A1 24" width plotter that has a remarkably small footprint given it's productivity, a 36" model which may suit Design offices where both A0 or A1 plots are required especially where space is at a premium & finally a 44" model that will appeal to many High Street Copy Shops who wish to offer more than just plan printing. The machines feature a convenient print stacker that is for the most part better than other options out there today and most importantly a Top Loading Front Roll Feed which is easy to get to, meaning that you can push the machine right up to the wall again saving on space. We love the fact that Epson have considered their users needs and introduced a NEW ink set for this range which is available in a mix of sizes, the Epson UltraCHROME XD ink is pigment based so has much superior light fastness than other technical printers and features a new Red ink which delivers vibrant images which are ideal for point of sale marketing work. The ink sizes start at just 110ml but go up to 700ML so if your a technical user who predominantly requires mono output you can always have a value for money Black loaded with smaller colour ink cartridges. We found the media selection very versatile and were surprised to find our test model was capable of printing on to 1.5mm poster boards, allowing for direct rigid prints which were ideal for photo output and planning displays without the need of mounting. output in draft mode which was at a very quick 28 seconds was definitely of an acceptable quality for site use and take it up a couple of notches full colour graphical output was achieved with ease.